• What is perfect parenting? Parenting can be really hard and even harder if we can't allow ourselves not to be perfect. So, we're all allowed to have guilty thoughts when times are rough, thinking of an easy way out of something, wanting to have someone looking after our kids while we go out etc. And most of all, we're allowed to have fun! A perfect mom is also a happy mom who can relax and enjoy herself, isn't she? To help you fulfil that last mission, I will now present you with some motherhood humor. 1) Only 34 Minutes Till Next Nap, Whohoo! Jumping up and down, up and down, up and down in my lap for hours on end was the only satisfactory activity my son would engage in for months as a baby. Secretly, while feeling somewhat guilty, my thoughts very often went to the question: How long till next nap and that brief sniff of freedom? 2) "Pis" - Oh Bum, His First Word! "Pis" is a Danish word. However, even though you probably don't speak any Danish, I don't really think it needs a translation. Despite my romantic hope of "Mom" being his first word, he chose "pis" as one his first words, just typical! Well, one morning I was trying to lock my front door with my keys and being in a bit of a hurry, I clumsily dropped them on the floor. 3) "Fireman Sam on the Potty Sits, Lovely Poo from his Bottom Slips, La La ..."
As you can see, I'm not very 'correct' nor do I follow unwritten rules very well. "irgitte, it's vulgar and you're ruining your son. All he will think about and talk about will be ... well ... those ... things! What if he talks about it in the nursery? What won't they think?" My mom says that I'm anally focused but let's be honest with each other, with a baby or a toddler there's a lot of poo and pee going around ... all the time! How can I not think of it; It's right there before me - and often on me - all the time! Besides the fun of inventing apparently provocative new lyrics to children songs and giving my son a quick laugh, it did actually help my son become conscious of his feeling the need to go. SSo sing away in the name of poo and pee, sisters and brothers, it's for a greater cause! 4) "See, This Book Is Really Good"
I remember my dad reading stories to me when I a little girl but what I didn't remember was that he used to try to skip pages. This he revealed to me the other day. Well, the apple doesn't fall far from the tree in this case. Sometimes I find myself not only trying to skip pages (he hasn't caught me yet) but also purposively choosing either the thinnest books or the ones with blessedly fat pages. 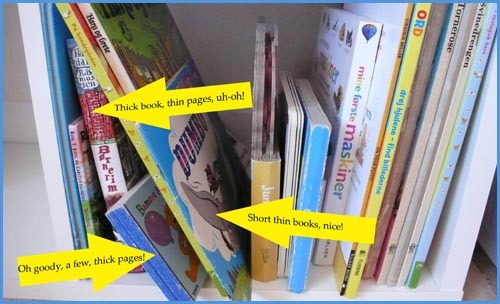 TThe most dreaded moment of the evening can be seeing my son looking excitedly at the shelf, reaching out for the one book that I put furthest in and away in the back: the thickest book with thinnest pages and the most text, oh, bum! to Start the No-Diaper-Training at Your Place!" Yes, the day has come when we take off our kid's diaper for the first time! And the big question is: "Where will this joyous first time event take place?" Well, as I'm raising my son by myself, we often spend the weekends at my parents'. "So", I sweetly argue to my mom, "I think we should try and take his diaper off at your place this weekend. I think it's important that we do it outside the kindergarten and, well, the weather's nice and you have, well, a garden!" She sees right through my argument of course, but I was very charming and likeable and my logic bulletproof (you know, gardens being a good place to start), so she accepted ... and yes, gardens are highly recommendable! 6) Uh-oh, Upcoming Poo in Sight ... Run Awaayyy! As I said before, I often spend time at my parents' in the weekends. When my son was a baby, I would often let my parents take my son for an hour or two in the mornings so that I could catch a bit more sleep (having a high need baby, I would only get a couple hours of sleep during the night). 7) Compulsive Persuasion by Stimulus Overload! Children's television is both a nightmare and a true blessing, all at the same time. However ... the nightmarish theme songs (sometimes I've woken up with the Postman Pat song mercilessly tormenting me in my head at four o'clock in the morning) and some of the series are just excruciatingly boring for the adult eye! 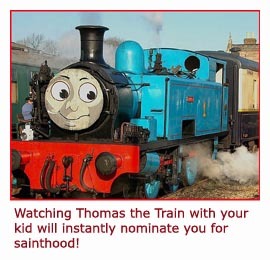 For some strange reason Thomas the Train brings ecstatic joy to my 2 1/2-year-old son. But nothing happens in this series. It's a train that, you know, goes to and fro between various destinations! That's It! Moreover, it's so static! The only things that move are the trains' eyes. No one talks as such - there's just a commentator that tells you what's going on! So out of desperation I bought a DVD with my own all time Danish kiddie telly favorite from my own childhood: "Omsen & Momsen" - well-knowing but not admitting to myself that my son would probably be way too young to see it, too much talking! However, no hurt in trying, right? So one evening, I said "Mommy's bought this really funny film with ... eh, Omsen and Momsen, eh... a baby and a boy, having lots of fun. Mommy really likes this so let's try it!" And before he could object I had put it in my laptop (I don't have television - I'm already having a hard enough time accepting the limited day's capacity of being only 24 hours. It would be downright silly of me to let TV take away some of those precious hours!). Here's another clip from "Omsen og Momsen" And yes, it's grown men playing a baby and a toddler and it's hilarious. Every Dane with a sense of culture will argree with me! "No, Thomas the Train, Thomas the Train!" 8) Eco-Junk Day - That Makes Junk Food Okay ... ish! Right? I have introduced a junk food day! Yes I have! Once a week - typically on Wednesday's when I have my half-week-what-on-earth-to-cook-crisis I buy pizza! However, in order to feel a bit better about it - and I know it's silly - I buy ecological pizza. I hope you enjoyed my not so perfect parenting moments. In time you will get to ad your own perfect parenting bloopers right here on this page. 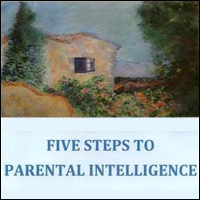 Good Parenting Skills For the Conscious, Open-minded Parent! 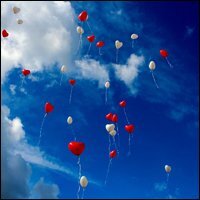 Effective Parenting Skills Nothing Kills a Tantrum Better than Unconditional Love! 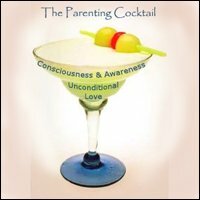 A Strong Cocktail of Consciousness and Love: Knowing What You Want for Your Kids and Being Those Qualities Yourself! 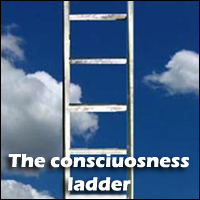 Expert guest post by Laurie Hollman Ph.D. - solving bad behavior in children with a conscious self-reflective mindset. Reduce Potential Child Health Problems with a Physiologically Healthy Lifestyle.